Most of the route of a proposed second transmission line from Hailey to Ketchum and Sun Valley would run along state Highway 75, but be placed underground between St. Luke’s hospital and the Ketchum substation. Map courtesy Idaho Power Co.
Idaho Power Co. has submitted an application to Blaine County to build a second transmission line between Hailey and Ketchum. The new 138-kilovolt line would provide added security against outages by backing up an existing line of the same voltage that already connects the Hailey substation with the Ketchum substation on Sun Valley Road. The Hailey substation is connected to the rest of Idaho Power’s grid by two redundant lines from the south. The company is applying to the county for a conditional-use permit to build the 12-mile-long line in Residential zones. The application will be heard by the Planning and Zoning Commission with a right of appeal to the county commissioners by any “aggrieved” party. The application has not yet been placed on the P&Z’s schedule. The company will also need to obtain a conditional-use permit from the city of Ketchum. Mike Barrie, Idaho Power’s facility siting coordinator, said that application will be submitted Friday. 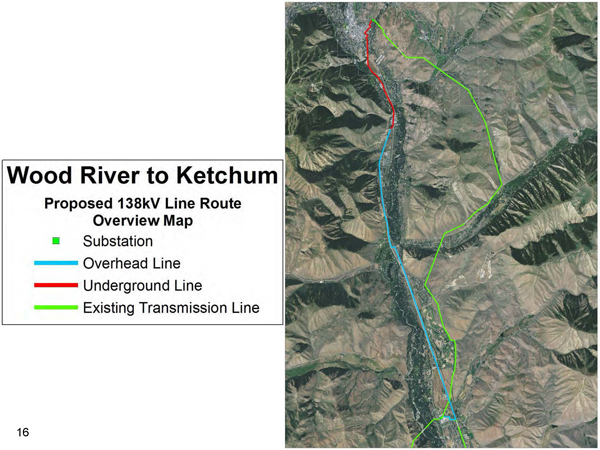 The existing transmission line runs from Hailey north along the east side of the Wood River Valley, up East Fork, then over a ridge and down into Elkhorn before connecting to the Ketchum substation. The new route would piggy-back on an existing lower-voltage distribution line along Buttercup Road and state Highway 75 as far as St. Luke’s hospital. From there, it would be underground along the west side of the highway and through Ketchum to the substation. The existing 39-foot-tall wood poles would be converted to 47-foot-tall steel poles to carry the new lines. According to Idaho Power, the new poles would develop a rusted coating that would mimic the color of wood. Estimated cost of the above-ground portion of the project is $5 million to $6 million. The underground part through Ketchum would cost an extra $14.3 million. According to Idaho Power, underground lines cost about 10 times as much to build as above-ground lines. Company spokeswoman Lynette Berriochoa said that’s due to the extra costs for excavation, conduit, thicker insulation and construction of underground vaults to allow workers to check the integrity of the line at intervals in the case of problems. Berriochoa said the city of Ketchum had requested that the line be underground there despite the added cost. Under Idaho Public Utilities Commission regulations, above-ground transmission lines are paid for by all the state’s ratepayers, but the increased cost of the underground portion of the line is borne by the jurisdiction requesting it. According to Idaho Power, creation of a citywide local improvement district to pay that cost would result in a one-time property tax increase of $230 per $100,000 value. Berriochoa said that between 2011 and 2013, the company had 40 neighborhood meetings, 17 meetings with city representatives and three open houses to discuss the proposed project. Barrie said the proposed project was the outcome of 12 meetings with a Community Advisory Committee, composed of 19 valley representatives. “We’re submitting the route that was pretty much the consensus of everyone involved,” he said. In previous interviews with the Idaho Mountain Express, committee member Len Harlig said that despite a search for better alternatives, the committee agreed that a second line was needed to ensure reliable service. However, Ketchum Mayor Nina Jonas said her city has not taken a position on the proposed project. On March 5, city Planning Manager Joyce Allgaier sent a letter to Barrie posing several questions, including whether there is a consensus among all municipalities and other interested parties that a second line is preferred to other alternatives, such as strengthening the existing line or generating power locally. The letter also states that it remains unclear how the additional expense to place the line underground would be funded. “We feel that there are many fundamental questions that need to be answered before we review their proposal,” Allgaier said in an interview. In a letter dated Feb. 5, Hailey Community Development Director Micah Austin said the project is consistent with the city’s comprehensive plan. Berriochoa said Idaho Power had originally planned to build the line in conjunction with the Highway 75 expansion project, which has required relocation of the distribution line to the west to accommodate a wider road. However, she said, the company could not complete its plans quickly enough to match those of the Idaho Transportation Department. She said Idaho Power will probably hold more public meetings on the project as the permitting process moves along.